This came on a day Governors Aminu Tambuwal (Sokoto), Simon Lalong (Plateau), and Samuel Ortom (Benue) were re-elected for second terms, having won Saturday's supplementary polls in their states, while Senator Bala Mohammed awaits today's court decision to be declared the winner of the governorship poll in Bauchi State. There was also anxiety in Adamawa State, where a court injunction stopped INEC from holding the supplementary election. In Plateau, Senator Jeremiah Useni, the PDP candidate rejected the results and declared his readiness to challenge the outcome of the governorship election in court. Similarly, the APC rejected Tambuwal's victory in Sokoto. The cancelled votes of 75,403 had made the INEC to declare the poll inconclusive, hence the weekend's supplementary exercise. On his twitter handle @atiku, Atiku Abubakar said: "I congratulate His Excellency, Governor Tambuwal on his re-election and I assure the good people of Sokoto State that they have made the right decision that will see them continue on the path to peace, progress and prosperity." He congratulated Governor Ortom of Benue State on his very well deserved re-election. saying "Mr. Ortom is not just a credit to the PDP, he is also an epitome of servant leadership which he urges all and sundry to emulate. With him again at the helm of affairs in Benue, the people of the Bread Basket of the Nation can look forward to times of refreshing and deliverance." The statement added: "Atiku Abubakar shares solidarity with Alhaji Mohammed and Engr. Abba Kabir Yusuf, who have made a great showing in Bauchi and Kano states, respectively. Victory is within reach. They have shown that they are men of the people and we are convinced that much good will come out of these men of enviable talents and leadership ability." While rejecting the result, Senator Useni said in a statement: "My team and I have gone through both the official results released by INEC and the documents submitted by our own field staff. We have every reason to believe that justice has so far not been done to our people in this election, because of massive rigging and electoral shortcomings. "After due consultation, I hereby state that the results announced by INEC are not acceptable to us. Consequently, we have requested our legal team to activate all the due processes to reclaim our cherished mandate. I give you my word that we will pursue this matter diligently, and by the grace of God, we will overturn and recover the people's mandate. The Restoration Agenda is for the soul of Plateau State, until its glory is restored." 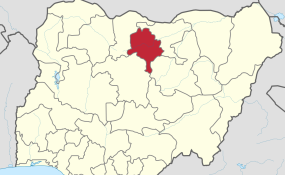 Addressing newsmen in Sokoto, APC's spokesman, Alhaji Bello Danchadi, rejected the declaration on the ground that the process was flawed with irregularities, which he said were duly reported to electoral body. He said: "We draw the attention of INEC to a number of polling units that were cancealed as result of violent attacks by thugs, while others were arbitrarily cancelled to please certain political party interests. "In view of these we deem it necessary to express our disagreement with the action taken by INEC to declare a winner without giving us a fair hearing in our position in the electoral processes." However, at the end of the exercise, the APC won the supplementary election conducted in 28 affected local councils. It polled 45,876 votes compared to PDP's 10,239 votes out of the 57,777 accredited voters as declared by the Returning Officer, Prof B. B. Shehu. Before the final results were announced, the PDP candidate warned of "unprecedented political crisis" if Ganduje was declared winner, while rejecting the outcome of the supplementary governorship election. Kabir-Yusuf said such announcement by INEC would throw the state into an "unprecedented political crisis" and will be resisted, claiming that the election was marred by violence, voter intimidation, and irregularities. Kabir-Yusuf, in a statement said: "The PDP gubernatorial candidate wishes to appreciate his teeming supporters who participated in the Kano Re-run elections which clearly gave victory to the PDP. Without your relentless effort, our party would have gotten the winning vote in the first election and the re-run respectively. "It is very unfortunate to have witnessed a gang-up against democracy by the trio of the ruling APC, INEC and the security agencies who connived, attempting to orchestrate broad daylight robbery of the People's mandate. "We want to categorically state that any desperate attempt by the already compromised INEC officials to declare Governor Ganduje as the winner of this re-run will plunge Kano into an unprecedented political crisis. The attempt would be resisted. "We urge all relevant stakeholders at state and federal government to, as a matter of urgency, call the attention of INEC to the need to immediately declare Abba Kabir Yusuf as the winner of the election, being the candidate with the highest votes in the just concluded election." A resident of Fagge, Malam Shehu, who hawks drinks told Vanguard: "There is anxiety about the election due to the irregularities that marred the re-run election and people are afraid that anything could happen and decided to remain at home." He said: "I am disturbed by reports from a number of places where unscrupulous persons were bent on subverting the will of the people to freely and fairly elect their leaders. "This is highly regrettable and stands condemned. For one who still bears the scars of our struggle for the enthronement of civil democratic rule in our great country, I enjoin all persons involved in the heinous acts of disrupting elections and preventing the people from casting their votes freely, to desist forthwith. "Our democracy is still nascent; let's be patriotic enough to guard against anything that will endanger it," Sani said. The Situation Room, a coalition of over 70 CSOs working in support of credible and transparent elections in Nigeria, in a statement on Sunday, by its convener and Executive Director of Policy and Legal Advocacy Center, PLAC, Mr. Clement Nwankwo. said it was worried that such violence occurred, despite the deployment of top-level Police officials, including a Deputy Inspector General, three Assistant Inspectors-General and Commissioners of Police to the state. It urged the Independent National Electoral Commission, INEC, to ensure an end to supplementary elections, saying "it appears that the process is now a manipulation tool to circumvent the elections." "Situation Room continues to reiterate that elections can be conducted devoid of violence. Reports received from our observers and partner organisations indicate that the supplementary elections were peaceful in some of the States observed, for instance Sokoto and Plateau, with only limited incidents reported. Violence was reported in some parts of Bauchi State, including Jama'are Primary School, Jama'are Local Government, Bauchi state, where the Police reportedly teargassed and carted away election materials. "There were reports of 4-6 party agents per party in each polling unit as seen in PU 028, Bukul/Bangire Ward in Shira Local Government of Bauchi State. In Duhuwa Polling Unit, Kofar Jauro Ward in Katagum Local Government of Bauchi state, party agents snatched a ballot box. "Kano State however witnessed widespread violence, intimidation and electoral abuse, particularly in Gama Ward, Nasarawa Local Government Area. In polling unit 006, Gama ward, fight broke out resulting in a police officer getting injured. "Similarly, there were reports of widespread reports of thuggery and intimidation of voters, observers and INEC officials by political party agents seeking to disrupt the electoral process and influence voters. Majority of the reports emanated from Gama Ward, Nasarawa Local Government. "In PU 006-011, a party thug used a gun to intimidate observers and voters to vote for his party. Also, in PU 006 domestic observers were harassed by political thugs and prevented from performing their observation duties. "Journalists were also reportedly chased away by thugs. In PU 034-036, political thugs reportedly threw stones at voters on the polling queue. Similar incidents were also cited in Gaya Kudu Ward in Gaya Local Government and PU 002 Chede Ward in Karaye Local Government of Kano State. "From reports received, the incidents of political thuggery could be attributed to the massive deployment of unaccredited political agents to polling units. This was widely reported in Kano state and in some instances in Bauchi State. "In Benue State there were also reports of violence. In Gboko Local Government for instance, a local government returning officer, Professor Comfort Dooshima Tuleun, was shot by unknown gunmen in Makurdi, Benue State, and now hospitalised. There was also the issue of political thuggery, in Uyam Ward in Ukum Local Government of Benue State, armed thugs invaded the polling unit and set the election materials on fire. "Situation Room is concerned with the conduct of security personnel during the supplementary elections. Some reports received showed instances of over-deployment of security personnel such as in Plateau State where there were at least 20 security personnel per polling unit. "Situation Room is further puzzled by the situation in Kano State wherein the deployment of senior Police Officers could not stem the incidents of political thuggery and intimidation. "Reports received from our observers showed instances where security personnel, most especially the Police and Nigeria Security and Civil Defence Corps, where challenging security situations were met with inaction. "This was observed in Beli Ward in Rogo Local Government and in Gama Ward in Nasarawa Local Government. "Situation Room is concerned that abuses of electoral process and violence have occurred despite the deployment of top-level Police officials, including a Deputy Inspector General (DIG), 3 Assistant Inspectors General and Commissioners of Police. In the previous elections, the State Commissioner of Police took charge without senior level officers. "It is therefore ironic and curious that this level of violence and political thuggery would occur with this quantum of senior Police Officers deployed. Situation Room has always advocated against redeployment of Commissioners of Police ahead of elections. "Situation Room acknowledges the involvement of the military in the periphery of the electoral process in accordance with section 29(3) of the Electoral Act 2010. "Some of the flaws observed are recurrent in Nigeria's elections. As a country, we need to condemn these acts of voter intimidation and insecurity that have reoccurred in the supplementary elections even leading to the shooting of a returning officer. "Safety of Election Day workers, INEC Staff and ad-hoc staff, returning officers and observers is not guaranteed and portends great danger for future elections in Nigeria. "Actions of political parties and their supporters continue to undermine the confidence in our electoral process as well as the rights of citizens to participate fully in elections and cast their votes without fear. "The widespread incidents of violence, thuggery and abuse of the electoral process especially as reported in Gama ward of Kano State must be addressed by INEC. "Situation Room believes that the levels of abuse recorded in Gama ward is of such monumental proportions as to necessitate INEC expunging the outcome of the supposed voting results coming from Gama ward from the final collation of results for the Kano State Governorship elections. "Situation Room also calls on INEC to ensure that there is an end to supplementary elections as it appears that the process is now a manipulation tool to circumvent the elections."